Growing a winter kitchen garden in our marine northwest climate is a gamble, but it’s one I’m willing to take because the odds are pretty good that the season’s days and nights will be temperate more often than they will be bitter cold. Still, I don’t want to risk losing when nature deals out temperatures in the low twenties or teens so I do what I can to beat the cold. I pile extra hay onto the already mulched beds of winter vegetables and cover it with lumber wrap*, weighting down the wrap at the edges with rocks. I sound pretty confident, but actually each time I’m faced with serious cold I’m totally anxious, uncertain whether the extra hay mulch and the sheets of lumber wrap will work this time. Could I have added a little more mulch? What if it gets really windy and the lumber wrap blows off despite all the rocks I’ve piled on the edges? Gambling is stressful. But sometimes nature deals me snow along with cold. While lumber wrap and hay alone do work, a blanket of snow insulation on top of what I’ve already spread out really increases the odds in my favor. For the past several days, I’ve looked out on the winter kitchen garden covered by this latest storm’s snow. The beds planted with winter vegetables reveal lumpy clues to what I’m betting is still alive. Blanketed in snow, lumber wrap and hay, Brussels sprouts and kale still stand tall; turnips, rutabaga, beets, celery root and leeks rise unevenly; parsnips and carrots lie flat. 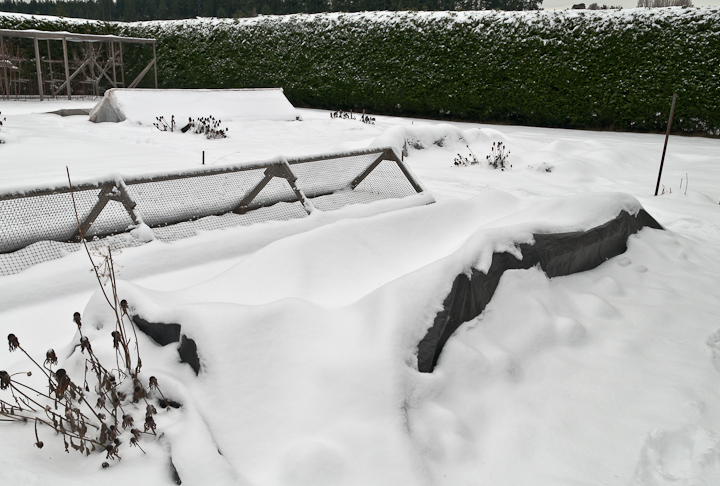 The cold frame and cloches are mostly snow covered, with just a bit of snow slipping from their peaks. It’s tempting open the cold frame or to dig down through the snow, lift an edge of lumber wrap and get a reassuring glimpse of healthy green but until temperatures rise above the low twenties I’ll resist disturbing the snow blanket. Instead, I’ll watch the thermometer and the forecast. Temperatures edging up toward the high twenties will mean I can start harvesting again. And temperatures above freezing mean this week’s snow could be gone in two or three more days. This morning, the thermometer read 32 so I headed out to the garden. The snow had gone from light and fluffy to heavy and wet. It took a while to remove enough of it that I could lift the wrap and free the plants. They were a little beaten down from the weight of the snow but they were green and have already bounced back. Once more, the gamble has been worth it. * Lumber wrap is the woven plastic material that lumber companies use to wrap lumber for shipping and storage. Over the years, I’ve saved lengths of it from various building projects. 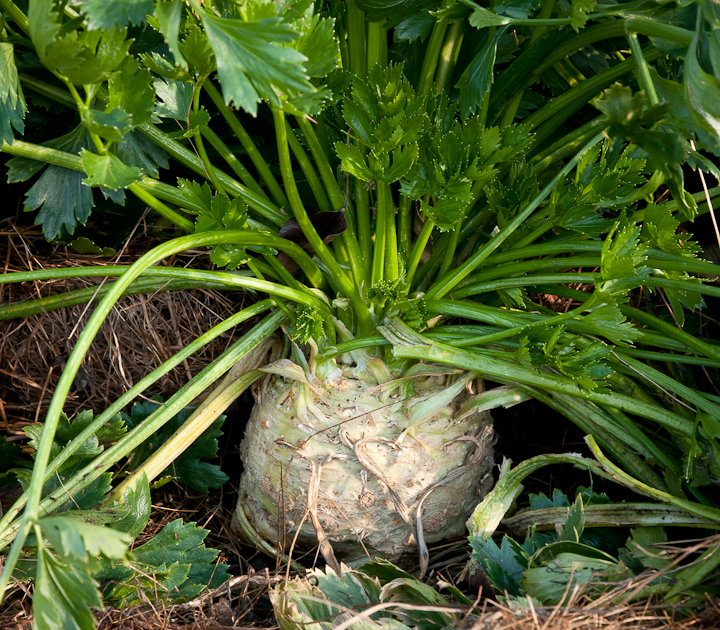 Seeing celery root for the first time in a winter vegetable garden, it’s easy to imagine that the leafy green, stalk-like tops are the edible parts. They do look a lot like celery, but in fact they are tough and bitter. The part to eat is the gnarly-looking, softball-sized bulb that sits beneath the stalks and above the soil line. Loosen and pull it from the ground and there’s another surprise. 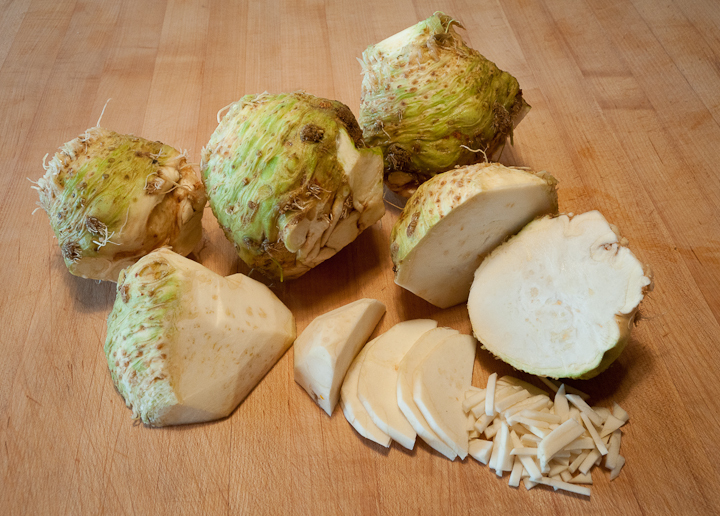 Celery root is not a single root like carrots, parsnips or turnips. Instead, a wild tangle of inedible roots covers the bottom of the bulb. 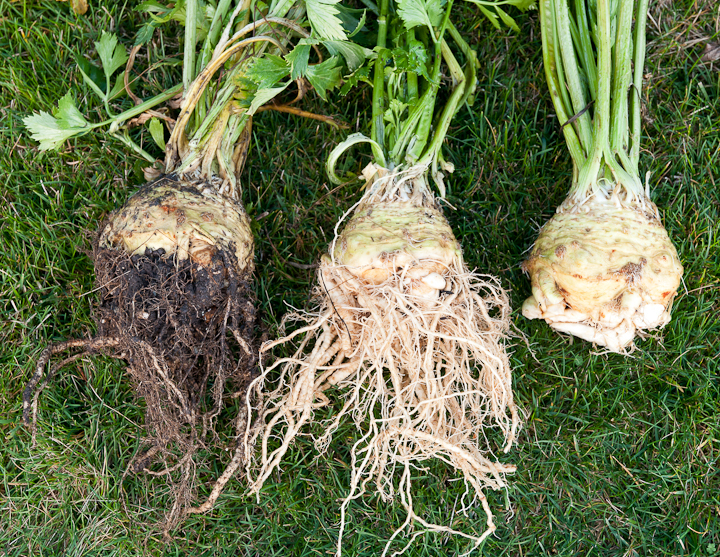 To get to the tasty bulb, you need to cut away both the celery-like top (no more celery) and root-covered bottom (no more roots). Its other name, celeriac, is much less misleading. I discovered celery root/celeraic in books on winter gardening when I moved to the northwest thirty years ago. Once I became aware of it, I started noticing intriguing recipes for it in cookbooks and magazines, inspiration for putting some effort into figuring out how to grow this odd-looking but delicious winter vegetable. Over the years, I’ve learned that celery root is not difficult to grow here in the marine northwest but it does take a long time to mature. 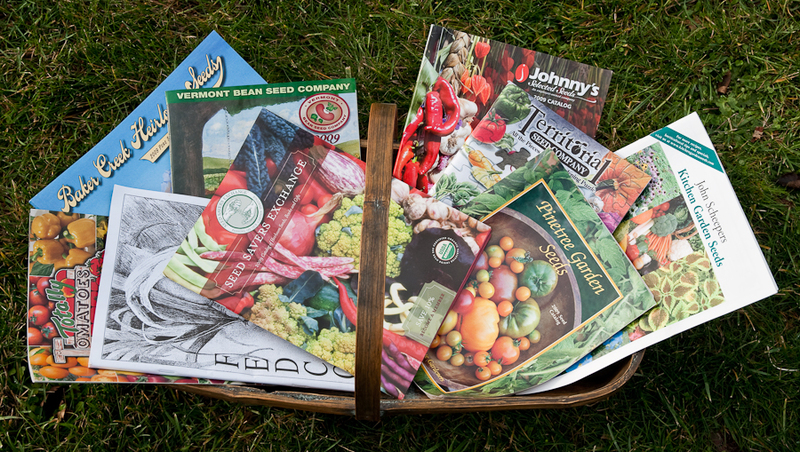 I start seeds indoors around the end of March and set seedlings out in the garden in mid-May. By late September the bulbs are mature, weighing one to two pounds trimmed, but I usually wait until we’ve had a frost or two to harvest it because celery root is one of the many winter vegetables that is sweeter after a frost. The seeds are a bit smaller than carrot seeds and germinate slowly and unevenly over several weeks. I start them in 2” pots filled with fine potting soil, planting two or three seeds per pot, covering them lightly, setting the pots on a heat mat and keeping the soil moist. My goal is to have forty plants to set out so I plant that many pots and thin to the strongest plant in each pot. When they are about three inches tall, I harden them off and set them out in the garden eight inches apart in rows one foot apart. I’ve learned that the plants won’t thrive if nighttime temperatures stay cool so I usually cover the new transplants with Reemay for the first month or so. The transplants grow slowly but steadily over the summer. I mulch them once they are established and then the only thing I need to do until fall harvest is to keep them well watered. Some sources I’ve read suggest that if they dry out or are watered unevenly, they can become bitter. Aside from this watering requirement, they are like so many winter vegetables: trouble and pest-free. I prefer to leave them in the ground rather than pick and store them all so in late fall I mulch them very heavily, piling old hay up over the bulbs and around the stems. If temperatures in the low twenties are forecast, I’ll cover them with lumber wrap and if temperatures in the teens are forecast I’ll pile more hay over the lumber wrap. This cold protection is a bit of a fuss but it’s worth it to have this tasty vegetable in the kitchen garden all winter long. 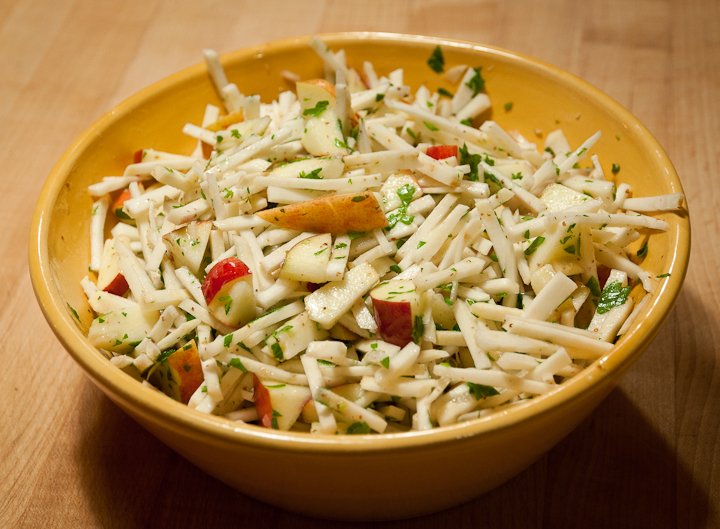 For the last several years, my favorite way to fix celery root has been to turn it into raw salads. After cutting the bulb in half and slicing off the thick outer skin, I cut the creamy white inner flesh into matchstick-sized strips, toss them in cider or white wine vinegar to which I’ve added diced shallots, salt and perhaps some Dijon mustard and let them sit for an hour or so. For a pound and a half of celery root, I use a quarter cup of vinegar, half a teaspoon of sea salt, one to two tablespoons of minced shallot and a tablespoon of Dijon mustard. Some recipes suggest blanching the celery root pieces for a minute in boiling water first, but I’ve found that simply marinating works better to slightly soften the strips but keep their crispness. Celery root does discolor unless it’s put in a vinegar marinade or a lemon juice and water mixture soon after cutting so I make the marinade first. Add some olive oil and you have a simple salad that features the nutty, subtly sweet celery and parsley flavors of celery root. For a richer experience, add some mayonnaise and heavy cream to create the classic French remoulade. For more flavors and visual interest, however, I often add diced apples, skins still on for color, maybe some toasted hazelnuts or pecans, some crumbled Gorgonzola or blue cheese if I have it, some chopped parsley or some mache. The mix of crisp and crunchy textures and nutty, sweet and sharp flavors makes a perfect winter salad. But celery root is wonderful cooked too. One classic recipe I return to at least once a winter is Alice Waters’ Delicata Squash, Potato and Celery Root Puree from Chez Panisse Vegetables (1996). 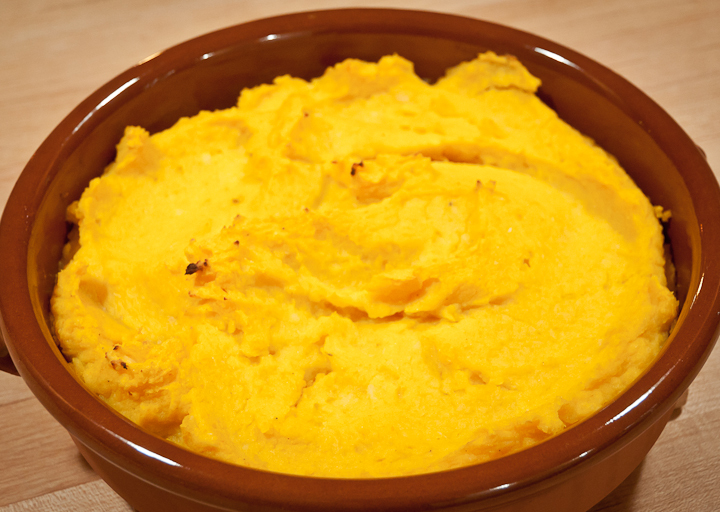 It’s sweet and softly orange from the squash, earthy from the potatoes and mysteriously nutty from the celery root. This Christmas I served it with a pork roast and apples sautéed with onions. As this recipe shows, celery root blends well with other winter vegetables—squash, potatoes, turnips, carrots, leeks—in purees and also in soups. Mixed with winter roots and roasted its flavor adds another earthy note. It’s also delicious by itself roughly mashed, pureed or roasted in chunks or slices. Google recipes for celery root and you’ll find pages of inspiration. And if you’re inspired to try growing celery root this year, the most available variety is Brilliant. I get my seeds from Fedco whose catalog description will convince you to try it if this post hasn’t already.